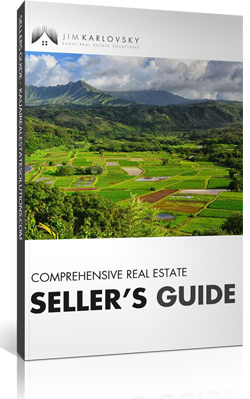 Pick up a copy of my Buyer & Seller Guides. You’ll receive top down picture of nearly everything you need to consider as a real estate buyer or seller in any market. You can request the guides below! Download the guides below, or ask a question and I will answer promptly! 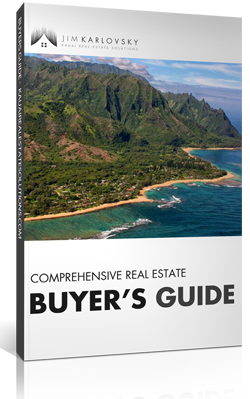 Many real estate agents practice on Kauai. From our experience as buyers, Jim Karlovsky is a great choice. We cannot imagine a better representative. He is dedicated to the profession, works extremely hard, has outstanding personal skills, and an appreciation for technical details and the local market. Early on, he nurtured a relationship with us to learn our tastes and desires for prospective homes on the north shore of Kauai. Throughout the process, he championed our position in some pretty challenging negotiations with the sellers and their agent. He excelled at listening, presenting the benefits to all parties in favor of moving forward. It was reassuring to learn about his solid training in law, but we were most impressed with his extensive experience in real estate (google his background), his people skills, and his desire to best represent our interests. He was very good at managing expectations of all parties, including ours. He also has excellent relationships with various types of inspectors and repair people. He always entered negotiations with a solid foundation in fact. It was important for us to understand exactly what we would be getting (basically a fixer/upper), what it would cost to repair and maintain the property, and why the discount in asking price (including our counter offers), already reflected many of these issues. After closing, Jim continued to work with us in arranging repairs of electrical and roof issues. A year afterwards, we can conclude with conviction that our purchase was quite a bargain. We continue stay in touch with Jim. Recently, he voluntarily helped to expertly guide us in negotiations with the state of Hawaii to reduce our initial tax-assessment base by 15% for this real estate. If we ever decide to sell, Jim will get the call. Jim was very insightful about timing the ups and downs of the real estate market and offered several options to consider when listing. Jim took excellent photos for MLS and communicated frequently with other realtors regarding the property. This showed us that he knew not only how to generate interest from potential buyers in our condo, but also, how to maintain that interest after the first viewing. Jim was very knowledgeable about the HI real estate contracts received from potential buyers. After accepting an offer, he was resourceful in assisting us to remove contingencies and acquiring numerous documents requested from the Title Company. Working with Jim was a pleasure and led to a successful sale. I have had the pleasure of working with Jim over several years as we prepared the Kauai home for sale. Jim provided essential improvement advice and market valuation. His knowledge of the local market is second to none as exemplified by the fact on listing our property the well-qualified buyer was secured in a matter of days at full price. Jim responds immediately to all questions and has put together well thought out marketing strategies. Add in Jim is genuine, so very personable and worked diligently to ensure a successful transaction. As a licensed broker in the Midwest, I highly recommend Jim for any island real estate need and as a resource for your future Kauai market exploration. 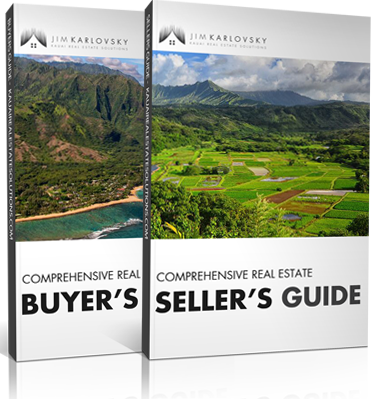 Jim was quite a resource to have in my position living off island and needing to sell a home on the island of Kauai. There were numerous small details that I needed assistance with in order for the process to go smoothly and Jim was there without reservations whatsoever to handle many of these things. I can say with confidence that Jim will go beyond the call of duty and get the job done! if I again have the need to buy or sell a home/property in Hawaii, Jim will be the first person that I call. I had a difficult condo to sell in that it was a lease-hold with 20 years left on the lease, with lease rents that continued to escalate every 10 years, with no option of a buy out of the lease with the lease holder. The condo was situated in a development with million dollar views to the south and west on the north shore of Kauai. Mr. Karlovsky spent countless hours explaining the lease hold process to hundreds of potential buyers. We did get a great offer very quickly, unfortunately, the loan for the buyers fell through very close to the closing date, and Jim had to start the process all over again. He always worked with professionalism and dedication to achieving a sale, and again spoke with hundreds of potential buyers, most, just lookers. We sold the condo, in spite of the odds, Jim always had positive feedback and a smile on his face through-out the process. I would recommend him highly to those that are interested in quality work, positive outcomes, and a thorough knowledge of Kauai, and all its potential as a viable real estate market. We worked with Jim to close on a condo at Pono Kai in Kapa'a. Within one day of property viewings, we narrowed our focus to 3 properties and made an offer that same day. Time to action is very important in a hot market like Kauai and Jim advised us on how to structure the offer to get accepted - which it was the next day. Jim guided us through was a complicated escrow, all the while responding in what seemed like real time. We closed the property on time despite the complications; and we now the proud owner of a great beachfront property! Thank you Jim for your market knowledge, fantastic people skills and responsiveness. Jim helped us sell our northshore condo that we owned for 16 years. From our first meeting through the final closing we never regretted the decision to use Jim. He has a great combination of being smart, having a great knowledge of the local market and he works hard for both buyers and sellers. In other words, a real professional. We would not hesitate from using Jim again or recommending him to others. Helped me rent a Vacant Land home in Kapaa, HI. We had a wonderful real estate shopping experience with Jim. We weren't so sure if we'd find a unit that met our requirements since we've looked around for 3 years now and a lot of properties were a disappointment. Jim came through because he listened and understood what we needed. In the end it was really surprising and we can't believe we finally found a place in paradise. Jim is really great to work with since he goes through the process of really understanding what we were looking for. Most importantly, he made sure we took our time to absorb and understand the potential of each property. Communication during the process of our closing is of great importance to me and Jim certainly did not disappoint. Sold a Condo home in 2016 for approximately $800K in Princeville, HI. The process was totally without much effort on our part. Jim took care of everything. We were kept up to date with every little detail of the transaction. We first met Jim over a year before actually listing our home. At no time was there every ANY pressure to secure our listing. It just happened when it happened. We would heartily recommend Jim whether one is buying or selling. You will not be sorry. Bought a Condo home in 2016 for approximately $575K in Princeville, HI. Jim recently helped my wife and I buy a condo in Princeville. Jim's knowledge, diligence, and patience were instrumental in finding us the right property and guiding us through the entire process. We didn't have much time on Kauai and Jim's preparation was tremendous- he had nearly 20 properties lined up on the first day for us to look at. He valued our limited time and was always available to answer questions or show other properties. His local knowledge was great and helped us narrow our list. We were very impressed with how smoothly Jim handled negotiations with the seller. He was extremely patient and guided us through the entire process through closing. We feel very fortunate to have worked with Jim and highly recommend him to anyone looking to buy property on the north shore of Kauai. Bought a Condo home in 2016 in Princeville, HI. Bought a Single Family home in 2016 for approximately $2.375M in Kilauea, HI. Jim helped us buy a beautiful house in Kauai in less than three months, from the day we looked at the house to the day we closed. He is very detail oriented and prompt in communication and follow up. He made everything easy for us to buy the house on the island while living in a different state. He worked with the sellers, coordinated all the inspections and repairs, got us the information we needed to start the utilities, introduced us to the neighbors, and helped us find a care taker for the house. The whole process was smooth and pleasant, thanks to Jim. Sold a Single Family home in 2015 in Kilauea, HI. Jim is the ultimate professional… but in a Kauai style casual way. He guides you through the process with an easy manor. He knows the North Shore of Kauai and lives there as well. Bought a Single Family home in 2015 for approximately $475K in Kapaa, HI. My wife and I had the pleasure of working with James Karlovsky on our first home purchase. I can't say enough good things about James: he spent a ton of time with us, answered all our questions thoroughly, kept us updated regularly, and took care of us throughout the whole process. He has a firm grasp on the nuances of Kaua'i real estate. A big reason we got our house was because the selling agent wanted to work with James: we actually weren't the highest offer on the first round - but were given a chance to put in a better offer because the Sellers were confident James would be easy to close with. James was the lynch pin in our purchase every step of the way. He kept in communication with all parties involved and even knocked on neighbors doors. His vast expertise helped us get the home of our dreams. James is very easy to work with, helpful with managing expectations, professional, knowledgeable, responsive, and positive. James is a fantastic realtor and knowledgeable guide through the home-buying process. Showed home in 2015 in HI. We (my wife and I) are first time buyers and we are very green about realestate. We live in Los Angeles but we stayed on the kauai island for about 9 months few years back. When we found Jim, started asking bunch of questions about realestate. Even though we were not on the island and he was not even sure if we were serious about buying a house, he took lots of his time and literally educated us on realestate. If I am not mistaken he easily spent over 20 hours on the phone with us for 4-5 months before we came back to the island. 1 - I could tell he was not only interested in closing deals. He was trying to understand what we want, what we like and don`t like. 2 - He took his time and give 45 minutes for each place but we were in and out in 5. After the second house we were already ahead of schedule about two hours:))) he immediately started making calls to re-arrange other places so we would not have to wait. We went to the island with 100% intention of moving. I had already got moving prices etc. But the last minute we decided to stay in LA couple more years. After all those hours was wasted he WAS STILL VERY SUPPORTIVE about our decision AND kept educating us. We are moving to the island for sure at some point and he will be our guy without a second thought. If you are thinking about moving to Kauai I would definitely recommend Jim Karlovsky. I dont know if one-on-one communication is possible on zillow but shoot us with any questions you may have about Jim.. Thanks a lot man for all your effort and time. You just made life long clients. Bought and sold a Single Family home in 2017 in Warrior, AL. Utmost Professional - Jim worked with me for 18+ months searching for my perfect Condo on Kauai. Jim is extremely knowledgeable, responsive & professional. His solid work ethic comes through in every conversation and engagement. Because I was searching from the mainland, Jim always went way out of his way to accommodate me for showings leveraging the latest technology available to accomplish our goals. I highly recommend Jim for any real estate needs on Kauai. His patience, perseverance and attention to detail really paid off for me in a positive, seamless transaction. He is well connected on the island and has a great network of support that will ultimately benefit your experience. Thanks Jim for all your hard work - couldn't be happier! Showed home in 2015 in Princeville, HI. We have thought we might like to live on Kauai. We had no idea where on the island we would like to live. We contacted Jim and made arrangements to look at houses that fit our criteria. He drove us all over Princeville one day and the next we drove all around Lihue. He was professional and answered all of our questions. He made us feel welcome and was a really nice guy. He spent a lot of time with us which we appreciated very much. When the time comes for us to make the move, we will not hesitate to contact him to find us the perfect house. Showed home in 2015 in Omao, Koloa, HI 96756. I recommend Jim without reservation. I have purchased and sold several properties over the years and Jim is at the top of the list of professionals with whom I have worked. I had corresponded with Jim before I travelled from San Francisco to Kauai to look at condominiums on the island. Jim was very responsive to my questions and requests for information. Jim spent a significant amount of time with me developing a strategy and identifying the properties that we would see when I arrived on the island. Once on the island, Jim spent two days with me showing me the precise types of properties that I requested and discussing the best strategic approach to my purchase. Jim's knowledge of the island, its neighborhoods and the specific properties that we viewed was exceptional. He provided me with valuable advise on important issues such as HOAs, future developments on the island, property management fees, rental income projections and comparative property analysis. Jim continues to diligently work with me on securing a property. I consider Jim to be the consummate professional and would recommend him to anyone who is seeking to purchase or list a property anywhere on the island. Showed home in 2015 in Beverly Crest, Los Angeles, CA 90077. Jim is simply the best. I would work with no other. We had an ongoing relationship for 8 months on the phone before I ever stepped foot in Hawaii to look for homes. He didn't know for sure whether I would buy or not yet he educated me on the process, answered every single question I had, sent me free information all the time. Was very dedicated from beginning to end without ever knowing I would be a client for sure. In Hawaii we were going to make an offer but due to business reasons ended up buying in Los Angeles. However for my second home I will work with him and no other. I have rarely seen a person be such a giver, honest, diligent and with such integrity. How much I recommend him does not fit into language. I tried to write brief but one can't be brief when it comes to Karlovsky. Bought a home in 2015 in Snacks-Guion Creek, Indianapolis, IN 46268. Found a tenant for a home in Olde Carlsbad, Carlsbad, CA 92008. I worked with Jim a few years ago. Another broker had promised sweet deals, but essentially abandoned us. Jim came in and diligently pursued all leads until the right one arose and he was able to carefully negotiate a good deal for us. Sold a home in 2015 in Kalihiwai, Kilauea, HI 96754. I am delighted to highly recommend Jim Karlovsky as a broker and real estate agent. Jim is a true gentleman who treats everyone with patience, dignity, and respect. His knowledge is extensive and he presents what he knows to the client so that the client is up to date on current real estate affairs. He also handles every transaction with the highest level of integrity. Jim will go above and beyond his job description to provide you with the best possible care. Jim would never encourage anyone to list with him or to buy from him unless that person was personally convinced that was there best plan of action. There is never any pressure from Jim. Last but not least he has a keen perception and understanding of how to approach people in a diplomatic fashion. This is an innate skill that is difficult for many to achieve. I cannot recommend Jim too highly. Showed home in 2015 in Wailua Homesteads, Kapaa, HI 96746. Jim was so helpful to us and showing us homes. He is very professional and was willing to show us homes all over the island of Kauai. We would definitely and will definitely recommend Jim to our friends and co workers that are in need of a Professional Realtor. Bought a home in 2011 in Rancho La Costa, Carlsbad, CA 92009. Jim was easy to work with, knew what I wanted to accomplish and worked hard to make it happen. He was very responsive, did a lot of research that helped make the deal happen. I would work with Jim again if the need arises. Having to settle my deceased cousin's estate, I contacted Jim Karlovsky to sell her house. He responded immediately to my request with an exceptionally detailed, impressive email. When I told him I was having trouble with the Mac computer, Jim showed me in a few minutes how to fix what I had been struggling with for hours!! I can honestly say Jim is a genuinely caring professional and if a cash buyer had not offered to buy the house, I would have definitely hired Jim Karlovsky to sell it. I would highly recommend Jim Karlovsky to anyone wanting to buy or sell property. Bought a Condo home in 2011 in Bressi Ranch, Carlsbad, CA. Jim helped us find the perfect commercial property to purchase in a very difficult market. He then was instrumental in clearing all the hurdles placed in front of us by the City and the bank. He then negotiated a great price for us for a great property. We would highly recommend Jim. He has integrity, perseverance and always does his homework. Bought and sold a home in 2013 in Serra Mesa, San Diego, CA 92108. Jim is one of the best brokers out in the industry. We did a fantastic job in helping us find great real estate. He never pushed us to a purchase for his commissions but rather he focused on products that matched our needs. This is a rare from your typical brokers which is why he will always stand out. Bought and sold a Condo home in 2015 for approximately $875K in Marina, San Diego, CA. Jim provided a wealth of market information and recommendations with our most recent townhouse sale. In the past, he was also extremely helpful in finding and negotiating the purchase and sale of other rental properties. He is very professional, knowledgeable and thorough. Jim was great real estate agent. Very approachable and knowledgeable of the local market. Very easy to communicate with and responsive to all emails and phone calls. Well prepared during our initial visit and had great planning for touring up to 19 properties within 3 days. Guided us well through the escrow process and kept good track of the timelines. Finally was able to get us a great house in a tough market. Highly recommended and would use Jim again for any real estate transaction. Bought a Single Family home in 2015 for approximately $1.4M in Kilauea, HI. Jim is knowledgable, hard working and a true professional! He was a pleasure to work with and I would not hesitate to highly recommend him to anyone in need of a real estate agent. Jim helped us find the perfect property to purchase in a very difficult market. He then was instrumental in clearing all the hurdles placed in front of us by the City (securing conditional use permit) and the bank (rolling tenant improvements into the loan amount). He then negotiated a great price for us for a great property. We would highly recommend Jim. He has integrity, perseverance and always does his homework.